Dr Philip S. Hench spent most of his career at the Mayo Clinic, specializing in arthritis, and noted that certain bodily changes, such as jaundice and pregnancy, reduced the pain felt by arthritic patients. Working with Edward C. Kendall to find the cause, Hench isolated cortisone and adrenocorticotrophic hormone (ACTH), which were used in the treatment of rheumatoid arthritis. His work earned Hench the Nobel Prize in 1950, an honor shared with Kendall and Swiss scientist Tadeus Reichstein. 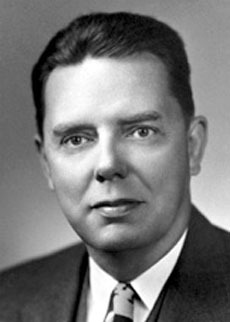 Hench also served in the US Army Medical Corps in both World War I and WWII, and spent decades researching the US Army famous yellow fever experiments conducted early in the 20th Century. His wife, Mary Genevieve Kahler, was the daughter of John Henry Kahler, who became wealthy operating a combination hotel and hospital in Rochester, MN, as the town's Mayo Clinic came to prominence. Their family's Kahler Grand Hotel is still considered prestigious lodging for Mayo visitors. Hench's brother, Atcheson Hench, was a longtime Professor of English at the University of Virginia, where his students included future novelist Erskine Caldwell.